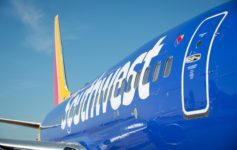 A Southwest Airlines 737 overran the runway at Burbank-Hollywood Airport yesterday, skidding to a halt. But a technological system prevented a far worse disaster. Flight 278 from Oakland to Burbank had 112 passengers and five crew members onboard. No injuries were reported. The incident, which occurred just after 9:00AM, did not shut down the airport, just one of the airport’s two runways. Still, several flights ended up being delayed and some were cancelled. As the aircraft bolted down the runway, far too fast to avoid overrunning it, an airport safety feature kicked in. It is called the Engineered Materials Arresting System (EMAS). The engineered materials are “high energy absorbing materials of selected strength, which will reliably and predictably crush under the weight of an aircraft.” Most often, these are crushable concrete blocks that an aircraft tire will break as it rolls over it. But the result is that it quickly slows down an aircraft. At Burbank, the EMAS system is located about 30-40 yards from busy Hollywood Way. The EMAS did exactly what it was supposed and designed to do — it stopped the plane from going through the blast fence. It didn’t hit anything else. The airport angel was with us this morning. It was raining hard yesterday in LA. A passenger on Twitter reported the the aircraft hydroplaned after touching down before the pilot was able to regain control. Since its just 15 minutes from my house, I use Burbank Airport as often as I can. This incident certainly won’t change that. But the runway is very short at Burbank. Often it leads to hard landings, as planes must land fast and apply the brakes. New runway plans have been opposed by neighbors who feel, even though the airport is over 85 years old, that they do not want to see any airport growth. Maybe a safety incident like this will change some minds. This also isn’t the first incident. I got over my general fear of flying years ago, but I will admit, the one scenario that still makes me really nervous is landing on a wet runway. Every time it happens, I’m paranoid we’ll have a hard landing and skid of the runway, making me an unwitting participant in the next episode of “Air Disasters”. Glad to see the arrestor system worked in this case. Why would this incident change the minds of the folks against a new runway? They’ll say (correctly) that the EMAS did its job…no need to expand. Are the runways really short? I thought that the airport runways were shared by the old Lockheed factory across from the terminal and that the runways were long enough to accommodate very large aircraft. Both Fedex and ups fly wide-bodied aircraft out of Burbank. Having lived 1200 feet from the end of runway 15, 65 or 70 commercial aircraft movements per day is quite a few. As for expanding the runways, to where? Burbank is surrounded by city. and most traffic -should- take off to the north, but does not unless it is storming and it is required by weather. Those people who live in Burbank proper won’t have it. North Hollywood and Van Nuys and Studio City must bear must bear that load. Although I most fly on paid first class wherever I travel to, I occasionally travel on lower premium cabin just for interest in the US, but I would never be on those one star Sh*t Southwest product. Where do you get your “one star” southwest rating from? You are quite the pretentious one, aren’t you? Slow day over at OMAAT, or did Lucky finally get tired of your BS? It is literally impossible to extend 8/26. You couldn’t really extend 15/33, for that matter, and straight-in instrument approaches don’t exist, and are virtually impossible to design, to any runway except Runway 8. While the NIMBY’s around BUR have created their share of problems, runway extension and approach paths are not among them. The terrain and built up nature of the area just don’t allow changes. The EMAS did the job. Could the runway not be extended further down Hollywood Way to take over the parking lots across the street (adjacent to Marriott)? An underpass could be built on Hollywood Way like further down the road.